Hello! I have a card to share with you today using some fab supplies from Taylored Expressions! This gorgeous silhouette is from the set Posh Posies and so is the sweet "hello" sentiment. I also used the beautiful Elegant Butterfly Overlays Die. The dp is Echo Park Paper Co. Sweet Girl and I used FTL 236 for my layout. 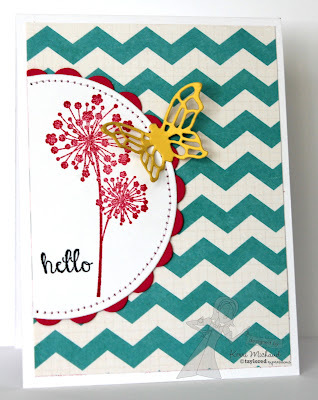 Love the chevron BG and offset circle...gorgeous card! Been thinking of you and wondering how the moving process was progressing. I just helped my daughter move to another apt. two houses down from her previous location. It really is hard work! Hopefully it won't be long before I read a post that you're in your new house!